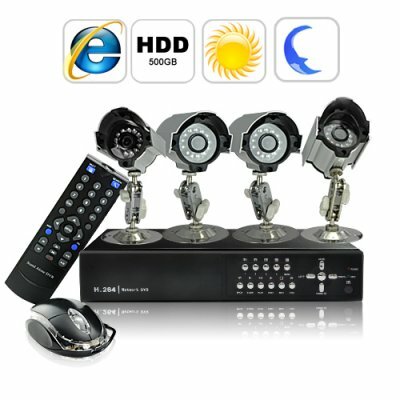 Successfully Added 4 Camera Security Kit - 4 Outdoor CCTV Cameras, H264 DVR, 500GB to your Shopping Cart. Surveillance kit complete with 4 Night Vision Security Cameras and 500GB hard drive for video recording. This is the ultimate security camera kit to create your own safety zone. This high quality kit set contains everything you need to setup a CCTV security system at your home or office and it even has internet connectivity for remote access. And more? Of course! With the Surveillance Security Kit you get: Pre-recording, Motion Detection, PTZ, Mobile Phone Browsing, Night Vision, Four Sony CCD, Weatherproof cameras and so much more! This incredible and extremely versatile DVR is your professional and high performance audio and video solution for surveillance. Use this DVR at home, stores, internet bars, small offices, and any other place you are worried about. You can connect the DVR to your monitor and watch the surveillance video (you can choose any camera or have 4 of them on screen simultaneously!) on site or program the unit to record with motion detection. It even comes with a full featured remote control. These amazing Surveillance cameras have high quality image and wide viewing angle. With aircraft grade aluminum construction and sliding hood, these weatherproof cameras are designed to stand up against anything Mother Nature can throw at it. The intelligent design light sensor in the security cameras will automatically turn on the 12 infrared (IR) night vision LED's when darkness arrives. This allows the camera to record crisp images during the day or night, giving your home or business the protection it needs 24 hours a day. That is a crucial step in ensuring your property is properly secured. Low price, high quality, and immediate shipment, this item is great for security product retail stores, small business or high-end home security system installers, or general security and surveillance resellers. No matter the customer, this Surveillance has everything you need for your personal/business security. Don't delay, immediately make your home and business more secure with a system designed for both the "average guy" as well as the "expert" to use. Enjoy peace of mind, add this to your cart now. 1. What is the viewing angle of the camera? 2. What is the cost for one camera microphone and cable? 3. In the package list you mention Dome camera, whereas the picture shows different type. Where is the problem? 4. I need 2 longer BNC cables than 18m. One should be 22m and the other 30m. Is this possible to replace and at what cost? 5. Is the 500GB HDD included in the DVR? If no what is the extra cost to include it? 6. What is the shipping cost and delivery time to Cyprus by post? (no courier, they charge inland taxes).